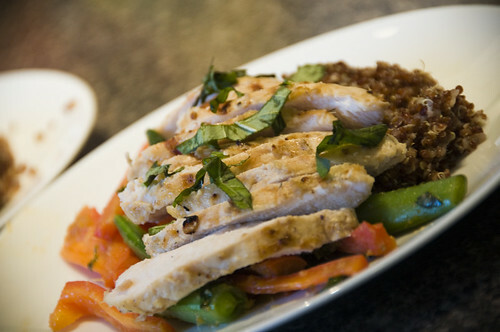 The Daily Struggles of the Domestic Un-Goddess: quinoa chicken and veggies...oh my! 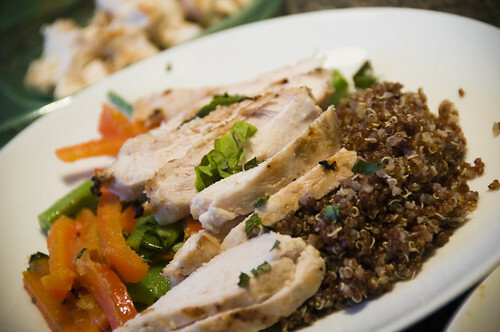 quinoa chicken and veggies...oh my! I'm not sure where you all live, but from my Ottawa-based perspective, summer has been a total write-off. Rain, rain and more rain. Cool weather (downright chilly yesterday, quite frankly). Miserable forecast, after miserable forecast. It has royally sucked. Blah. BUT, that hasn't stopped hubs and I from enjoying yummy food from the grill (or food that tastes like it could maybe be from the grill). Though we've only had one alfresco meal this summer (a rotten record, I concur), we haven't starved yet. I've got three yummy things for you today - a tasty grilled lemongrass chicken with quinoa (courtesy of epicurious), a DNM original seafood risotto, the best grilled side of salmon you'll ever eat in your life (courtesy of Clean Eating magazine). We've been having a lot of fun introducing Z to all sorts of new foods. Thus far, the kid seems to have an undiscrimating palate. I could fool myself into thinking that she's a bit of a pint-sized gourmande, but I think she just eats everything, and asks questions later. She quite liked this lemongrass chicken recipe. I thought the chicken part of the recipe was five-star. It was juicy, flavourful and delicious. I loved the smokiness from the barbecue and the zip from the marinade and it was awesome afterward in wraps, salads, etc. The quinoa was a bit meh. I was initially excited by the idea of red quinoa, but this recipe just doesn't do it for me. I've discovered that quinoa is a real black hole for flavours....no matter how much you add to it, it just soaks it up...so while one might think that cooking in broth would result in a lot of flavour....it really doesn't. I think you're better off tossing the quinoa with a little oil (to seal it off) and then a little something with acid and bit (like lime juice and chopped onion....or something like that). 1. Marinade: Puree shallots, lemongrass, ginger, 1/4 cup oil, lime juice, tamari, sugar, sea salt, pepper, and coriander in a blender until smooth. 2. 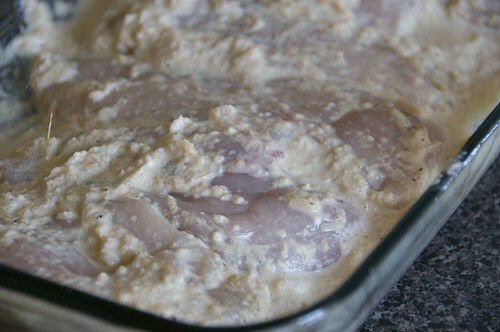 Place chicken in a baking dish and spoon on marinade, rubbing it on all sides. Cover; chill 1/2 to 2 hours. 3. Heat 2 teaspoons oil in a medium saucepan over medium-high heat. 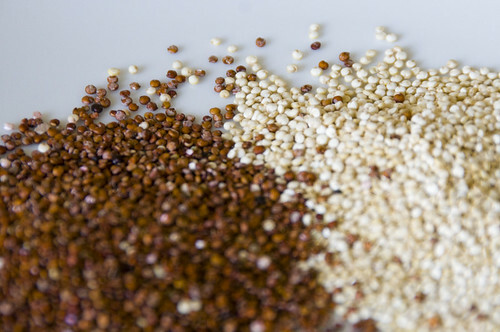 Cook quinoa until toasted, 3 to 4 minutes. Add broth; bring to a boil. 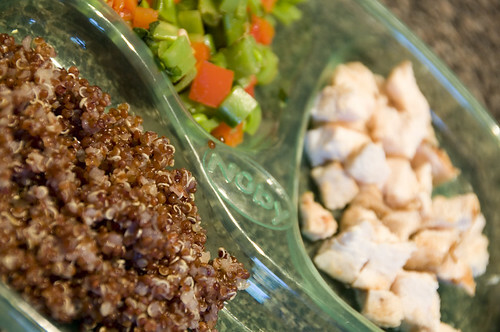 Cover, reduce heat to medium-low and simmer until quinoa absorbs liquid, about 20 minutes. Turn off heat; let sit, covered, until ready to serve. 5. 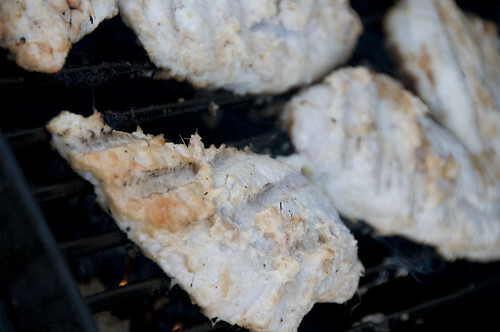 Slice each breast on the diagonal into 1/2-inch pieces. 6. 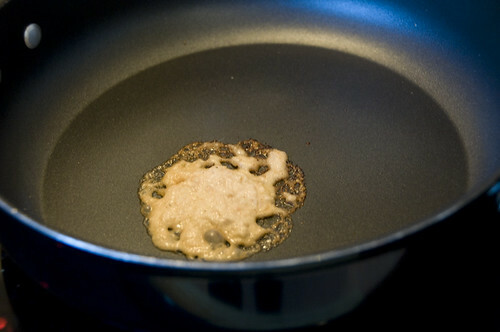 Heat remaining 1 tablespoon oil in a large skillet over medium-high heat (I added the leftover marinade). Cook sugar peas and peppers until crisp-tender, about 3 minutes. Season with salt and pepper. Turn off heat. Add mint and toss. Divide quinoa among 4 plates. Top each with 1 sliced chicken breast and 1/4 of the vegetables. Z's was a little different....she did like it though! Gobbled up the chicken like there was no tomorrow.